Jalna natural Greek yoghurt is a smooth and beautiful yoghurt.So lovely by itself for a snack or delicious with fresh fruit for a lovely dessert. This is a great sized tub if you eat a lot of yogurt or use it as as a base for dips or marinades. Jalna products are pot-set unlike other yogurts and do not have artificial sweeteners, preservatives, gelatine or colours making them very natural and delicious, This is a brand I trust and recommend. I tried this on a health kick and found that the taste is very strong though its smooth and healthy for you and could make a great dip.. i recommend trying jalna yogurt. i love jalna and this one is a great size to feed yourself and the lids / whole family. it has a great taste and is a beautifyl texture. Absolutely with out a doubt my favourite yoghurt, and even better is it comes in a huge 2kg tub! Thats enough to last a few days! I enjoy the taste of this Jalna Greek Natural Yoghourt. 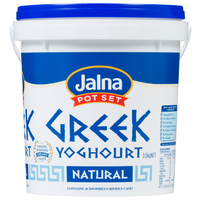 I like this Jalna Greek Natural Yoghourt. Great product. The whole family loves it. Versatile for cooking and for eating plain. Always in our fridge. Love it with honey and in smoothies.